Copper Tape Versus Braid For Better EMC Performance - Rexel Australia. Did you know that VSD (Variable Speed Drive) cable with copper tape delivers better EMC Electro Magnetic Compatibility) performance than traditional braided cable? 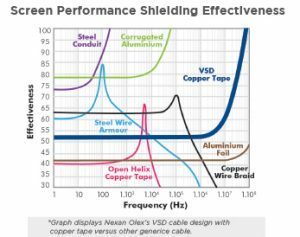 Studies show that 100% coverage metallic shields such as copper tape increases shielding effectiveness compared to copper wire braids particularly at high frequencies, so it is ideal to use in a variety of VSD applications (including manufacturing, tunnels and processing plants), where noise and interference may affect performance of nearby sensitive electrical control and signaling equipment. Looking at the graph you can see that for flexible cable, it is traditional to use copper braid which decreases in effectiveness over 1.105 Hz. If the application allows, it is possible to make cable with flexible conductor and use copper tape for maximum shield effectiveness. For best performance of the screen, a gland must be used that connects the screen to ground inside the gland. The gland must connect to the screen around the whole circumference of the shield to provide a low impedance to ground. Ideally the VSD will be housed inside a conductive metallic enclosure that ensures low impedance between the cable screen and the VSD ground point. EMC is defined as the ability of an electrical or electronic device or system to function satisfactorily in its electromagnetic environment without introducing intolerable electromagnetic interference (EMI) to anything in that environment. EMC encompasses controls of both unintentional emissions from a range of products that can interfere with radio communications as well as protection of a range of devices that may be susceptible to intentional transmissions. Superior EMC performance for efficient operation of Variable Speed Drives can be achieved with reduced impact on nearby electrical and electronic systems. Why Varolex® VSD NEW Flexible Cable design? Varolex® unique design incorporates 100% coverage copper tape screen, symmetrical split earth, increased earth sizes and low capacitance insulation. It delivers superior EMC performance through better transfer impedance and shielding effectiveness. PVC bedding and Nexans Olex quality manufacturing processes help maintain the circular shape of the cable throughout the entire length for consistent handling. Varolex® VSD Flexibles also incorporate a flexible copper conductor for fast and easy terminating. 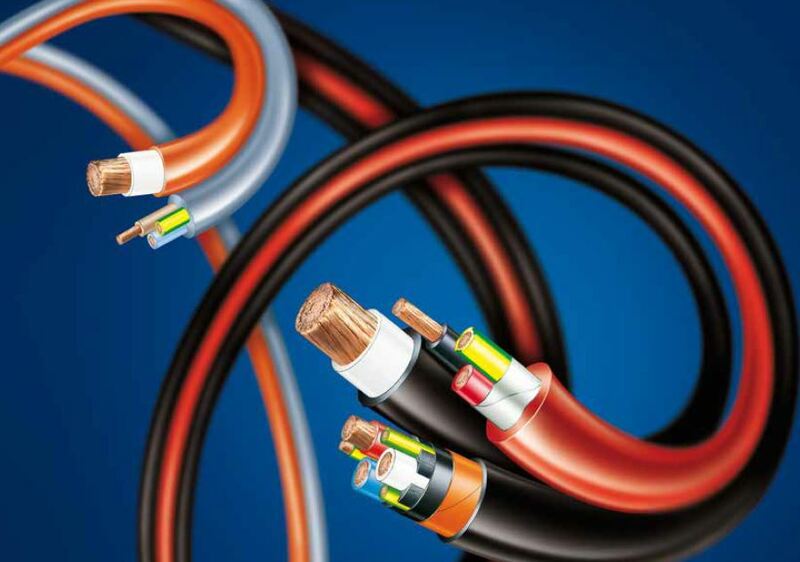 High voltage breakdown strength XLPE insulation and PVC best practice sheathing compounds gives you security that Varolex® VSD cables will continue to perform over time.